Having vanished from the public’s affection, magic is back with a cinematic flourish. Harry Houdini died 80 years ago, but Death Defying Acts, starring Catherine Zeta-Jones and Guy Pearce as the escapologist, began shooting in Edinburgh last month. Peep Show’s David Mitchell and Robert Webb are putting the finishing touches to Magicians, their first feature film. And The Prestige, starring Hugh Jackman and Christian Bale as Victorian illusionists opened in cinemas this weekend. Emphasizing why the UK never embraced the charisma-free David Blaine, it has Jackman explaining an audience’s muted reaction to one of Bale’s brilliant tricks, declaring his rival “a great magician” but “a horrible showman”. As their mentor, played by Michael Caine maintains, every great trick consists of three acts. The Pledge, in which you show the audience something apparently ordinary. The Turn, in which you show them something extraordinary, like making the object disappear. And The Prestige, where you miraculously bring it back, unharmed. Cinema’s Pledge came at the height of magic’s popularity, the period between 1860 and 1920 when magicians were bigger than movie stars, when magic began to shake off its supernatural associations and challenge the new uncertainties of science and technology. Magicians were the first to show films in Britain and France and today’s standard cinema techniques, those cuts and fades, shots and reverse shots, all started as their tricks. French magician and filmmaker George Melies pioneered moving illusions in the films he showed at the Robert-Houdin theatre in Paris, named after the great illusionist from whom Houdini took his stagename. Though magic was eclipsed in the middle of the 20th Century by the fantastical science of space flight and the atomic bomb, cinema’s Turn arguably arrived in 1975, when George Lucas founded Industrial Light and Magic to create the next generation of visual effects for Star Wars. Lucas created a galaxy that appeared as believably real as it was incredible, the extraordinary made ordinary. Post-hobbits however, with ILM’s computer wizardry cast on everything from Harry Potter and The Goblet of Fire to the forthcoming Transformers movie, CGI now frequently seems overly slick, cold and electronic, lacking the warmth and human ta-da! of a craftsman’s recognisable sleight of hand. Hence cinema’s current Prestige moment, satisfying appetites for the showmanship of illusion’s golden age. The ‘Mousetrap’ technology and clockwork mechanics of these classic tricks evoke nostalgia, certainly, but it’s a smoke and mirrors screen, one that alongside the special effects still understatedly employed in films like The Prestige and forthcoming Edward Norton-starrer The Illusionist, serves to support multiple layers of plot ‘reality’ and misdirection. 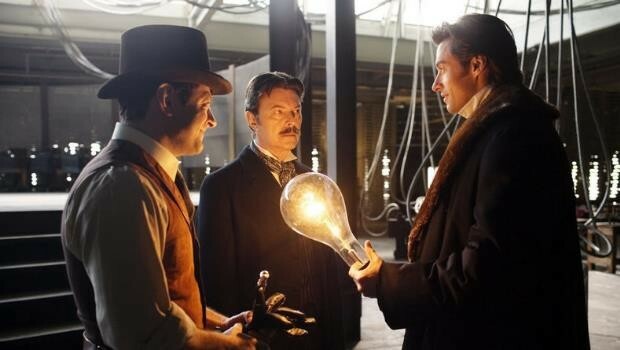 Most fantastically of all though, The Prestige actually makes it appear that David Bowie can act. A version of this article originally appeared in The Scotsman, November 11, 2006.